Cole Evans spent many years with a tribe deep in the jungle after being abandoned as an infant. He now faces trying to find his destiny in the small town of Turtle Cove. He then finds a place thought to be a fantasy called the Animarium where he teams up with four others who all trying to see if they are going to be the new leader of the Power Rangers Wild Force team. Each of them given special powers to help keep Earth safe from evil. The Animarium is a large island in the shape of a turtle that floats high in the sky. The wild Zords live there as well as Princess Shayla who becomes the Power Rangers Mentor. There the power rangers travel back and forth to the Earth to either train, or seek advice from the princess. The form of transportation between the island and the planet Earth is the famous power ranger teleportation that has been used in other seasons. Cole who has a love for all animals is shocked to find out the enemies they were fighting were heartless monsters. The rangers all use their special powers to battle the Orgs who are lead by Master Org. Cole finds out that he as child was presumed dead after the death of his parents. They were once scientists from turtle cove and were sent out to the jungle on a job. When they went out to work they had a companion they were friends with who was jealous and vengeful with Cole's father who had proposed to his mother before he had a chance to. When they found the remains of Master Org the man consumed his powers to get revenge on Cole's father but he began to go insane and instead of only killing his father also killed cole's mother. Later on Cole who is a Red Ranger has to team up with the other red rangers before him to stop the generals from the Machine Empire from recovering Serpantina from the moon and reactivating it. Serpantina is actually the zord of Lord Zedd of the Machine Empire. The nine red rangers that were once before him were Jason, Aurico,Tommy, Theodore, Jarvis, Andros, Leo, Carter, Wesley, and Eric. All ten team up to make sure that Serpantina is never recovered and the safety of the planet remains. Duke Org Onikage arrives in the Nexus with a plan to infiltrate the Rangers' Animarium and capture Princess Shayla. Buried beneath the surface of the Moon lies the dreaded Serpenterra - the most powerful Zord ever built. For years it has remained undisturbed, but now the forces of evil have finally rediscovered this colossal terror. The remaining forces of the evil Machine Empire, under the command of General Venjix, have discovered this weapon of great destructive power and are preparing to unleash it on the people of the Earth once again. But already, the forces of good are preparing to stop them. Under the command of the great veteran Red Zeo Ranger - Tommy, the mightiest team of superheroes ever gathered is assembling. From every group of Power Rangers on Earth, and even those across the galaxy, the leaders of their teams are banding together to form the Earth's last line of defense against the threat of Serpenterra. Commemorating, the tenth year anniversary of Power Rangers, all ten Red Rangers from the series' history unite. This time, taking the battle to the enemies and ridding the galaxy of the menace of the Machine Empire and Serpenterra once and for all. The Wild Force Rangers, Wes, and Eric, are reinforced in their battle against the Mut-Orgs when the Power Rangers Time Force travel back in time to the present in order to stop the Mut-Orgs for good. The Time Force Rangers reunited join the Wild Force Rangers on the Animarium along with Ransik and Nadira. Jen, skeptical of Ransik, must put aside their past and accept his help in dealing with the Mut-Orgs. Ransik tells of how in the distant future while he was still angry at the world, he freed the three Mut-Orgs and allowed them to merge with his own mutant DNA so they could threaten humanity. The three Mut-Orgs join forces with Master Org, recognizing him as the 'true Master.' Together, they attack the Turtle Cove power plant, seeking to cause an environmental disaster to create an army of Orgs to rule the future. The combined Ranger teams, Ransik, and Nadira battle it out with the Mut-Orgs. During the battle, Ransik sacrifices himself to negate their mutant DNA powers. The Mut-Orgs now weakened are destroyed by the Rangers and Ransik is miraculously cured from his unstable mutations for good. The two teams of Power Rangers join together for a victory party on the Animarium. Three fugitive Mut-Orgs from the year 3001 travel back in time to help Master Org change history. The Wild Force Rangers team up with the Silver Guardians, Wes, and Eric, to battle these Mut-Orgs. Meanwhile across town, a mysterious cloaked agent from the future tracks the fugitive Mut-Orgs from the shadows. In the future, Time Force Rangers Lucas, Katie, and Trip seek help stopping the rogue Mut-Orgs from their former enemies Ransik and Nadira. When the Wild Force Rangers, Time Force Red Ranger and Quantum Ranger lose badly in battle against the Mut-Orgs, they are saved at the last second by the mysterious cloaked agent - Time Force super-cop Jen, the Pink Time Force Ranger! Using Nayzor's crown, Master Org, Super Jindrax, and Super Toxica resurrect Nayzor as Super Nayzor to fight the Power Rangers. In a devastating battle, Super Nayzor badly injures Taylor, Alyssa, Max, and Danny. Retreating back to the Animarium, Cole and Merrick are the only Rangers left able to fight the Orgs. While they go to Turtle Cove to fight Super Nayzor, the other four comatose Rangers enter a dream state where they hover between life and death. There they are guided by a mysterious boy of regal bearing who tests them to unlock the previously unknown Zord that has slumbered on the Animarium for 3000 years - the Falcon Zord. Using their brains and courage to solve the puzzle of the Falcon, they return to good health with the Falcon powers to augment Cole. Cole unlocks the Animarian Armor mode and uses his new Falcon Summoner to defeat Super Nayzor with his friends' help. Believed to be dead by the modern world, Master Org finds his tombstone in a cemetery in Turtle Cove and creates the Tombstone Org from it. While battling it, the Rangers discover the Deer Zord in the wild - a wild beast that recognizes Merrick, but has sore feelings toward him. Princess Shayla explains that 3000 years ago, every morning she would sing to the Deer Zord while Merrick played his flute for it, and it is probably upset that nobody has sang to him since. Merrick and Princess Shayla reunite to play their song for the Deer Zord to entice it into helping the Rangers finish the Tombstone Org. Alyssa's father comes to Turtle Cove to visit his daughter. Disappointed that she has apparently neglected the family's tradition of practicing martial arts, he scolds her. Alyssa pleads with him to allow her to focus on her own path in life by going to Turtle Cove University and studying environmental science instead of taking over the family dojo. But when the Rangers battle Samurai Org, Alyssa's father sees the White Ranger expertly use martial arts techniques he taught his daughter. He realizes that his daughter has honored his teachings while seeking her own path. Max must convince his former bowling mentor, Don, to help the Rangers defeat the powerful Bowling Org. Max reflects how he had to give up an opportunity to learn from Don before when he was recruited to become a Power Ranger. Believing Max is a quitter, Don refuses to teach him his famous tornado spin. After watching Max dedicate himself to practicing, Don finally believes Max is sincere and has matured as a person. He relents and teaches Max his famous Tornado Spin that helps the Rangers defeat the Bowling Org. Alyssa and Cole seek information about Cole's parents at the library. Before they could find relevant information, they are called by the other Rangers to fight Org monsters. During the battle, Cole is injured and develops amnesia. Just when the teens find Cole on a farm, they are attacked by Orgs. Cole finally recovers his memory after defeating the Orgs. Later, the kids learn that Cole's parents are presumed dead when they discover their grave stones. But Cole takes heart as his tombstone is right next to his parents, and after all he turned out to be alive after being presumed dead. Elsewhere, Jindrax and Toxica discover Master Org's shocking secret - that he is a human pretending to be an Org. Also he is the missing person in the photo Cole carries with him of his parents and himself as a baby. When Jindrax and Toxica revolt against Master Org, the Master uses his powers to enslave them into mindless fighting machines as Super Jindrax and Super Toxica. The Rangers break the curse of Zen-Aku and now with his memory restored and the evil spell finally broken, Merrick must decide whether to team up with the Rangers or remain on his own. Seeking to trick Jindrax and Toxica, Merrick asks them to take him to Master Org. Master Org and Nayzor see through his trick and strike him down. Master Org takes the four stolen Animal Crystals that Merrick took from the Rangers while he was Zen-Aku to create Quadra Org. The Rangers battle Quadra Org and Merrick risks life and limb to help them. Zen-Aku's Animal Crystals, moved by Merrick's courage, rush to his aid and give him the powers of the Lunar Wolf Ranger. Merrick uses the Predazord to help the Rangers destroy Quadra Org. Nayzor tries to retreat with the Animal Crystals but Merrick intercepts the General Org and destroys him regaining the Animal Crystals. Merrick returns the crystals to the Rangers but refuses to join them as part of the Wild Force team, much to the surprise of the Power Rangers and Princess Shayla. With his memory blocked, Zen-Aku obediently turns the Rangers' stolen crystals over to Nayzor who then orders Zen-Aku to destroy the Rangers. During a lunar eclipse, Zen-aku temporarily returns to his human form of Merrick. He tells the Rangers about his journey from good to evil - 3000 years ago Merrick placed a Wolf Mask on his face in order to defeat Master Org but discovered he couldn't remove it. As the mask begins to turn him into Zen-Aku, Merrick begs the other Ancient Warriors to destroy him. Their hearts wouldn't let them do it, so they entombed him instead. The Rangers and Princess Shayla realize that the Moon is what gives Zen-Aku his power. Armed with this new knowledge, the Rangers set out to break the spell over Merrick once and for all. Depressed after losing four of the Animal Crystals to Zen-Aku, the teens decide to reclaim their crystals. Using their Wild Force Megazord, the Rangers confront Zen-Aku. Attaching his newly acquired Bear Zords to the Predazord, Zen-Aku attacks the heroes when a mysterious figure appears from the sky and pleads with Zen-Aku to remember his past. After the battle, Zen-Aku reflects upon the mysterious person when Nayzor approaches him and tricks him into opening a box containing a fly that blocks his memory. It doesn't take long for the teens to discover that Zen-Aku is really an ancient Animarian warrior named Merrick. While Zen-Aku kidnaps Princess Shayla, Taylor is confronted by an Org she couldn't defeat during her first assignment as a Ranger. Shaken by her experience, Taylor nevertheless helps the Rangers rescue the Princess but they are later defeated by Zen-Aku when he uses their own captured Zords against them. Making matters worse, Zen-Aku successfully steals Taylor's Bear Crystals. Max is forced to hand over his Giraffe Crystal to Toxica in exchange for the safety of the passengers riding an out of control bus with no driver. Max and Alyssa evacuate the passengers from the bus just as it transforms into the newest Org, Bus Org. The Rangers fight fiercely to retrieve the crystal only to have it stolen by Zen-Aku who combines his Dark Wild Zords to form the powerful Predazord. Princess Shayla tends to the Rangers' wounds after their disastrous battle with the evil Wolf Duke Org Zen-Aku. Saddened that her crystal was stolen, Alyssa secretly leaves her friends in search for her it. Meanwhile, Nayzor confronts Zen-Aku and demands the Elephant Crystal. The defiant Zen-Aku declares that he will no longer take orders from Nayzor or Master Org. Later, the Rangers join Alyssa in her search for her crystal and confront Zen-Aku. Zen-Aku, however, reveals that he controls three Dark Wild Zords of his own. Using his magical staff, Master Org transforms an ancient stone statue into Nayzor, a powerful Org general. Under orders from Master Org, Nayzor releases the wolf-like Duke Org Zen-Aku from the tomb that has imprisoned him for the past 3000 years. Zen-Aku proceeds to attack and defeat the Rangers and steals the Elephant Zord Crystal. With the Red Lion Zord injured, Cole and the rest of the Rangers go on a quest to find the mythical Soul Bird - an elusive creature from ancient times that had the power to heal the Wild Zords. Jindrax and Toxica recruit the Bull Dozer Org to level the forest before the Rangers can find the bird. When Toxica makes the Org grow, Red Lion risks it all to help the Rangers by jumping into battle despite his injury. 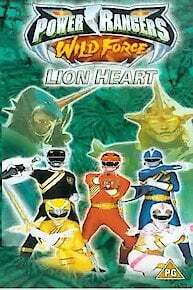 When Red Lion is hurt again in battle, the other Rangers engage in battle with Jindrax, Toxica, and the Putrids while Cole runs through the jungle in search of the Soul Bird. On his own, Cole comes face to face with the Master Org. Master Org attacks Cole. In the battle, Cole's photo of himself as a baby and his parents falls from his pocket. Master Org is shocked to see the photo and as he picks it up he begins to recall sketchy memories of his own past where he chased Cole's parents and baby through a jungle. As Master Org used his vine powers on Cole's parents, it is unclear what happened to them next. Cole snatches back his photo from Master Org just as the Soul Bird appears to them both. Master Org zaps the Soul Bird causing it to flee. Taunting Cole, Master Org informs him that the Soul Bird never appears twice and thus the Lion is history. From the depths of the jungle, the Gorilla Zord rushes into battle helping the other Wild Zords fight the Bull Dozer Org. Combining with the Gorilla, the Wild Zords form the Kongazord and defeat the Org. As the Rangers lament their missed chance to find the Soul Bird, they discover its nest and find a Soul Bird egg inside it. Finding new hope, the Rangers take it back to the Animarium as Cole comments how this Soul Bird in the egg, much like himself, will never know its mother. Taylor meets two mysterious twins dressed in white and black sneaking around her old Air Force Base. Taylor reflects on how she discovered the Animarium one year ago and has been considered Missing In Action since. When she battles the Cell Phone Org, gobbling up people's cell phones, she is injured in battle but is saved by the two mysterious twin boys. While the other Rangers are forced to fight the Cell Phone Org without their powers, Taylor helps the two twin boys sneak back into the military base and retrieves two flowers for them. Rewarding her for her bravery, the two boys reveal themselves to be the long lost Polar Bear and Black Bear Wild Zords. They combine with the Megazord and allow the Rangers to defeat the Cell Phone Org. Unfortunately their raw power is too much for the Red Lion and the Megazord disengages. The Rangers are left wondering how to cure the injured Red Lion Zord. On a class field trip to some nearby caves for her archaeology class, Alyssa discovers a symbol on a cave wall that matches her Ranger belt buckle. Princess Shayla and Cole accompany Alyssa down to Earth to investigate, but the Tire Org captures Princess Shayla and speeds off with her. To help the Rangers catch up with this high speed Org, the Wild Zords transform into Savage Cycles - sophisticated living motorcycles for the Power Rangers to ride on. While the Tire Org grows giant-size to fight the Rangers' Megazord, Jindrax and Toxica take Princess Shayla to Master Org in the cave with the symbol. Master Org commands Princess Shayla to release the Wild Zord trapped by the symbol, but the Princess says only the Wild Zord can choose who can release it from the cave. Alyssa arrives to rescue Princess Shayla and the Elephant Zord trapped in the cave chooses to give its Animal Crystal to Alyssa. Alyssa summons the Elephant Zord to combine with the Megazord allowing the Rangers to defeat the Tire Org. Princess Shayla and the Rangers realize there are other Wild Zords still out there waiting to be discovered. Episode 4 - Never Give Up! When Danny meets his old love interest Kendall, he immediately falls back in love again. Danny and Max's friendship is tested when Kendall diverts Danny's attention away from Max. When Max is captured by the Bell Org, Danny remembers how he owes his life to Max and considers him his best friend. Remembering Max's mantra of 'never give up,' Danny is determined to rescue Max at any cost. Finding newfound confidence in himself, Danny tries to tell Kendall how he has always loved her but gets cold feet at the last second. On the Animarium, Princess Shayla informs Cole about the events that happened 3000 years ago which are affecting the present. She tells him how the Kingdom of Animaria fell to the Orgs during a great battle. To protect the Wild Zords and the Princess of the Kingdom, six ancient warriors - the predecessors of the Power Rangers Wild Force - used their magical abilities to cause the Valley of the Wild Zords to lift off into a floating island in the sky where it would be safe from harm. This turtle-shaped island left a turtle-shaped hole in the Earth which would eventually become Turtle Lake - the center of the city of Turtle Cove. Cole disregards Taylor's rule book for the Wild Force team, finding her leadership style too rigid. Unhappy with this new style of leadership, Taylor goes off on her own to fight the Camera Org. But when the Camera Org takes her picture, she becomes invisible. Cole must use all his instincts to outwit the Camera Org and save Taylor's life. The evil Jindrax and Toxica find the Nexus, birthplace of the Orgs, underneath the city of Turtle Cove. Hoping to find the Master Org there, they find a slightly different incarnation of their master, who easily intimidates them into following him. Master Org then sends the Barbed Wire Org and his foot soldiers, the Putrids, to fight the Rangers. Cole tries to reach out to the Orgs, believing that all living creatures have hearts, but he is horrified to find out that the Orgs don't have any. When Toxica uses her magical powers to make the Barbed Wire Org grow giant size, the Red Lion instructs Cole how to make the five Wild Zords combine into the Wild Force Megazord to fight back. With the power of the Megazord's Megaroar attack, the Power Rangers save the day. Cole, a young man raised in the Amazon rain forest journeys to the city of Turtle Cove in search of clues to where he came from. While adjusting to life in the concrete jungle, he is soon approached by four well-meaning teens who take him up to their home - a floating island in the sky called the Animarium. The Animarium is a giant nature preserve for gargantuan beasts known as Wild Zords, including the Red Lion Zord which calls out to Cole specifically. In the ruins of an ancient temple, Cole meets Princess Shayla and is recruited to become the Red Ranger and leader of the Power Rangers Wild Force. The five Rangers' first mission is to defeat the nefarious Plugma Org and Turbine Org, with the aid of their Wild Zords. Ricardo Medina gets six years for killing roommate. Power Rangers Wild Force is currently available to watch and stream on Saban. You can also buy, rent Power Rangers Wild Force on demand at Netflix, Amazon, iTunes online.